At a ceremony on 9 May 2017, 27 new members were installed by The Gin Guild’s Grand Rectifier Martin Riley into the Gin Guild. They each swore an oath, while symbolically holding juniper berries, to protect the spirit’s quality and production around the world. 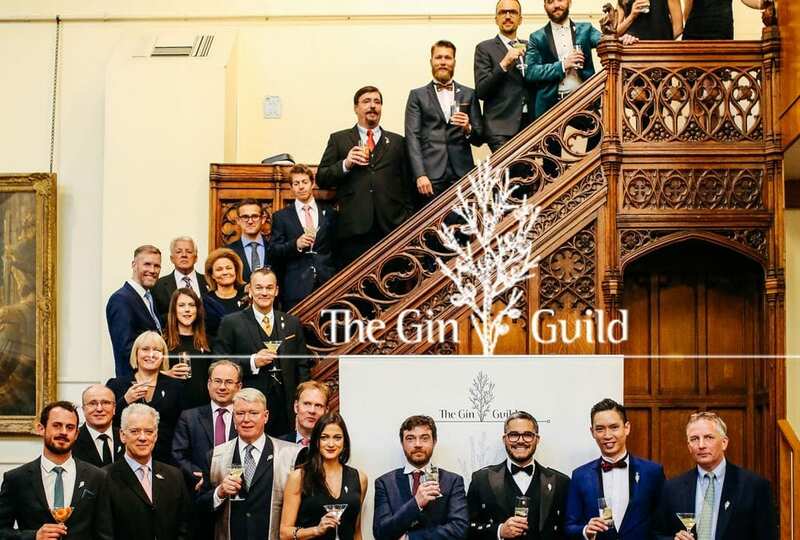 A Canadian distiller was one of 27 new Gin Guild members installed at a ceremony at the Guildhall in London this week. Thomas Steinhart, from Steinhart Distillery in Nova Scotia was installed with the rank of Warden Rectifier (the first Canadian distiller to do so), alongside representatives of brands made in Sweden, Scotland, Guernsey, the Isle of Wight, Cambridgeshire, Surrey and Birmingham. Charles Rolls, co-founder of premium mixer brand Fever-Tree, which has for many commentators in large measure underpinned the explosive growth in gin sales, was amongst others who were installed in the Guild in the rank of Rectifier. Industry body The Gin Guild, established five years ago, has its historical roots in the Worshipful Company of Distillers dating back to 1638. The Guild also held its first non-UK installation ceremony last month in the USA at the Gin Summit. It has grown to a membership of 225. New members were installed in the presence of the Guild’s Grand Rectifier Martin Riley, Board Chairman Christopher Hayman (whose family have been involved in gin distilling since 1863), and Guild Director General, Nicholas Cook. New members swore the Guild oath, promising to protect the spirit’s quality and production around the world, while symbolically holding juniper berries (the key botanical in gin). Martin Riley said: “Gin is a wonderful example of how skills are being developed and employed in the craft of distilling. Innovation and experimentation from a new generation of distillers complements the established skills and experience of those distillers who have been producing exceptional gins for many years. The aim of The Gin Guild is to bring together gin distillers and industry leaders to jointly promote and encourage a commitment to excellence in gin distillation and industry custodianship of the spirit. The Guild also welcomed Eric Sampers from Chivas Brothers who assumed the rank of Founder Warden. Founder Wardens are appointed by the four Guild founder companies, Bacardi, Chivas Brothers, Diageo, and William Grant and Sons. Nine brand owning members were installed in the rank of Warden Rectifiers: Xavier Baker from the Isle of Wight Distillery; Jonathan Engels from Crossbill; Stephen Marsh from Pinkster; Peter Martin from Broker’s; Ian McCulloch from Silent Pool; Henric Molin from Spirit of Hven Backafallsbyn AB; Matthew Polli from Three Fingers; Thomas Steinhart from Steinhart Distillery and William Wemyss from Darnley’s Distillery. Sumaiyah Connolly (Chivas Brothers) and Joanna Segesser (Diageo) were installed as Founder-nominated Rectifiers. Timothy Ching from Hong Kong, the Beefeater MIXLDN 6 Global Champion, whose winning cocktail beat competitors from 33 countries, and Jamie Jones, who won the global Gin Connoisseur Program in 2013 and who currently works as global bar executive for The Social Company were also installed as Rectifiers. Installed as new Warden Nominated Rectifiers were: Philip Craig (Crossbill Distilling); Conrad Gauntlett (Isle of Wight Distillery); Emma Hooper (Darnley’s Distillery); Tom Hutchings (Silent Pool Distillers); Robert Nicolle (Three Fingers); Anja Molin (Spirit of Hven); Nick Ravenhall (nominated by ATOM); and Luke Smith (Poetic Licence). Appointed in their own right as Rectifiers were Patrick Braun, Founder of the gin bar ilBar @ilBoccone in Constance; Bjoern Hollmuller, Brand Ambassador for Wild Alps gin; Kate Meehan of gin tour company Shake Rattle and Stir; Charles Rolls co-founder of Fever-Tree, and Professor Katherine Smart, Chief Brewer of ABInBev and President of the Institute of Brewing and Distilling. A presentation was made to Gin Guild founder Chris Parker, of London and Scottish International, who is stepping down from the Guild’s board. Membership of the Guild is open to a range of gin industry players with various classes from; Warden Rectifiers, who include distillers, producers and brand owners; and Rectifiers, who have roles in the production, distribution and marketing of gin, including leading bartenders, journalists, marketing experts and educators. For media enquiries please contact Nicholas Cook at nicholas.cook@theginguild.com +44 20 33 97 27 37 or Jenny Grinter, Mosaic Publicity jenny@mosaicpublicity.co.uk +44 1206 841933. The Gin Guild is a spirit industry member funded, not for profit body, supported by the four major gin distilling companies, Bacardi, Diageo, William Grant and Sons and Chivas Brothers, but representing the gin industry as a whole. It aims to promote the gin category across the globe, enhancing its image and widening its appeal to worldwide consumers. It is the natural home of gin innovation, including new start-ups and craft distillers and craft distilled gin. The Gin Guild brings together gin distillers and industry leaders involved in the production, promotion, distribution and consumption of gin and promotes and encourages commitment to excellence in gin distillation and industry custodianship of the spirit category. Gin Guild members, reflecting gin production and consumption, are international and include those from the UK, Austria, Belgium, Canada, Finland, France, Germany, Japan, Italy, Liechtenstein, Mexico, Norway, The Czech Republic, Spain, Sweden, USA etc. The Guild is an industry association. It does not seek to promote any particular branded product or products but aims to bring the widest range of products and their producers and those associated in the wider industry, together in order to provide a valued forum for all those involved in gin production, sales, marketing and distribution. The historical role of the Worshipful Company of Distillers – one of London’s old historical livery bodies – originally granted the right to supervise distilling in London in 1638 by Royal Charter, was to hold key responsibilities for the control and regulation of early gin distillers. That provides a unique historical link to the gin industry placing London at the historic heart of the modern gin category and industry, though the industry is now worldwide. The Worshipful Company of Distillers through the work of The Gin Guild, its subsidiary, provides and facilitates a wider opportunity for those involved in the industry to participate in a modern convivial industry forum, reflecting and including many of the traditions of the City. Founder Wardens: The Four Founder companies appoint the four Founder Wardens. Warden Rectifiers: This group is limited to producer/distillers and brand owners (excluding supermarket own brands and retail off trade, and/or ineligible gin styles, and smaller low volume craft distillers). This is held as a corporate representative position (with only one such position in each company). Rectifiers: Individuals involved with the wider gin industry (including small craft distillers and those involved in production, distribution, marketing sales, bar staff, retailers/buyers, journalists, educators, and other commentators). The installations of the Grand Rectifier, Wardens and other members of the Guild are by way of solemn ceremonies, reflecting the traditions of the trade guilds of the City of London. Guild members receive a certificate of admission to the Guild, a silver Guild “juniper sprig” insignia and a commemorative Guild plaque. The Guild arranges, co-hosts and/or facilitates access for Guild members to a programme of gin related events and celebrations. Full details are available on request, but will include Guild installation ceremonies (including an option for full members of Guild installation at the prestigious venue of the Mansion House, London, followed by the Worshipful Company of Distillers Banquet in the famous Egyptian Hall). As at May 2017, Guild membership stands at 225, with the members representing, through their respective companies, thousands involved in the gin industry.